What a beautiful country Canada is in the summer, particularly in bloom! With the kind of weather we have much of the year, we truly believe in celebrating our summers and with it the gorgeous gardens across the provinces. BBCanada.com asked our B & B owners to recommend some of their local gardens and our sincere thanks to all the owners who participated in this venture. This is by no means a comprehensive list of all Canadian Gardens. See it as suggestions by some of our members on where to visit this summer if you are in their areas. Enjoy! 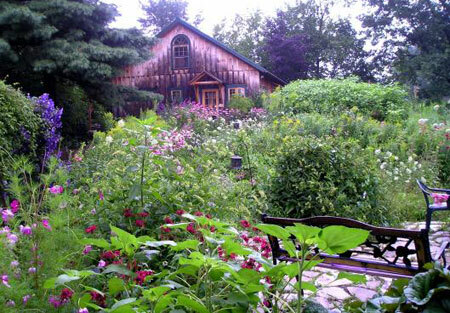 Julie Fréchette and Alcide Paradis from La Capucine in Sainte Placide 30 minutes from Montreal have a not to be missed garden in proximity to their B & B called Route des Gerbes D’Angelica. Route des Gerbes d’Angelica is an initiative of professionals from different backgrounds who share a common vision of the world based on cooperation. It is located on an agro food road in Mirabel, Quebec. A non-profit organization founded in 2008, the official opening was in June 2010. A 94-acre land was purchased in Mirabel and it continues to expand. Peacocks, a fungi nursery, were added in 2012 and in 2013 a splendid shade garden in the middle of an ’opencast cathedral’, handmade artisanal bread cooked in one of the three outdoor ovens, more activities for corporate groups and new local products made with angelica. Since the opening, over 18,000 visitors have toured the gardens and expressed their satisfaction. Tours are offered seven days a week. There are ten different thematic gardens, marrying aesthetics, ecology, music and humanitarian mission. Home, country, fairy, observation, discovery, bird, contemporary, grass, rose, Zen, english and cut flowers. Gardens are open from mid-May to mid-October. Throughout this period, you can visit the gardens from 10 a.m. to 5 p.m., 7 days a week. Guided tours are scheduled at 10 a.m., 11 a.m., 1 p.m. and 2 p.m.
Pina Macku from Pinorama B & B advised us that The Eastern townships had a Garden Tour in Knowlton on July 10th. There are many wonderful places to visit in the area. Citizens of Lac Mégantic encourage tourists to visit their town especially in light of recent events. Our hearts go out to the community and they need tourism support. www.easterntownships.org. Omemee Blooms held their annual Members Garden Tour on Monday July 15. Stillwater on the Lake, a local bed and breakfast was featured on this year's tour. 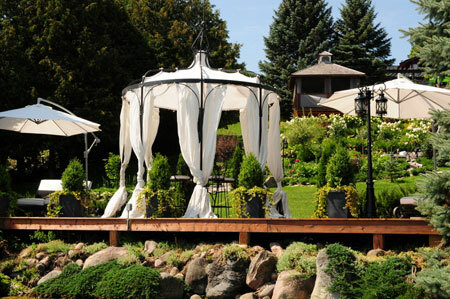 Stillwater on the Lake is a new Bed and Breakfast located on Chemong Lake in Peterborough and boasts extensive perennial gardens, tranquil water features and relaxing gazebos. Please contact Sunny Montgomery at Stillwater on the Lake (705) 741-3886 or visit www.stillwateronthelake.com if you would like a private tour of the Stillwater gardens! Sunny is always happy to oblige and loves sharing her pride and joy with other gardening aficionados! For more information about other upcoming garden events in the area visit www.omemeeblooms.ca. 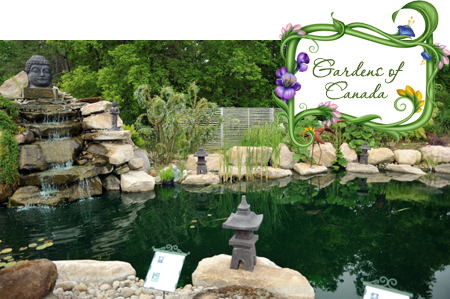 At Burley’s Executive Garden Suite in Peterborough, Ontario Bob and Margaret have 2 acres of English theme gardens. There are twelve gardens each with a distinct focal point. 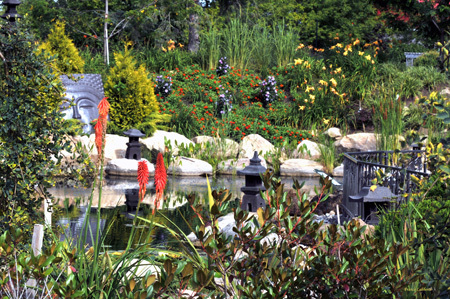 A pond, beautiful Japanese Koi, water lilies, and a babbling brook are some of the features. The suite overlooks the gardens. People are always welcome to stop and tour the gardens and browse at the Garden Gift Store for beautiful gifts to take home. Visit www.burleys.ca for more information. The Rural Gardens of Grey and Bruce Counties network to promote visits to many of the rural gardens of Grey and Bruce Counties. They offer an opportunity to share the delights of a variety of rural garden venues. Lynn McCurdy from Cedarholme Bed and Breakfast and Cottages in Hope Bay tells us that the group produces a beautiful annual brochure describing each garden and other local attractions as well as many local business ads (including B&Bs).The brochure folds out to show a large map with each garden location. Lynn has 2 of the gardens very close to her B & B.
Ruth & Gord Henrich of on the Haven on the Bay B & B in Red Bay are also close to some of these delightful gardens. As you tour, you may identify many Rural Gardens of Grey and Bruce Counties gardens by the yellow Daisy signs. Members of the group share a willingness to open their gardens and the desire to have others share the experience. Some gardens offer facilities such as hiking trails, several offer plants for sale and others organically grown produce. Admittance to the gardens of the RGGB members is by set fee. Each garden owner determines any entrance fee. Visiting hours include some scheduled hours as well as by appointment only. The Blooms for Africa Garden Tour took place in North Hamilton and supports Grandmother’s to Grandmother’s Friday, July 19th, and Saturday July 20th, 6 p.m. to 10 p.m. This campaign was started in March, 2006 by the Stephen Lewis Foundation to raise awareness of and support for grandmothers in Africa. As a result of the HIV/AIDS pandemic a whole generation has died leaving orphans to either fend for themselves or taken into care by their grandmothers. These grandmothers are themselves grieving the loss of their children and now are raising their grandchildren. Although with little financial means they are very resourceful and with support can provide food and education for children in their care. 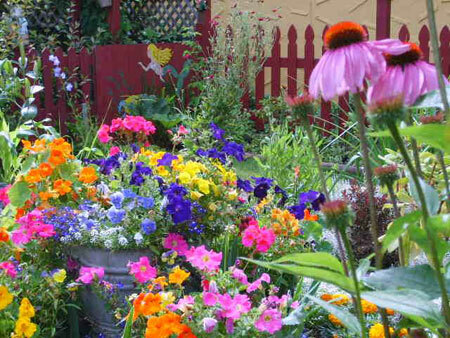 The Durand Neighbourhood Association of Hamilton also organizes a garden tour in the middle of June featuring 10 different gardens. The HIStory and HERitage gallery has photo exhibits about the mansions and gardens in this historic area of the city. Janis and David Topp at Rutherford House are located in the Durand neighbourhood and they have been part of the tour in the past. Pat Sang from Eaglescroft B&B in Tottenham is very knowledgeable about gardening and shares her expertise willingly. Her gardens are a testament to her hard work. Many communities offer open gardens where it is complimentary to visit gardens and Pat’s garden is one of them. There are glimpses of the garden on her website www.eaglescroft.com. Pat also recommends the website of the Ontario Horticultural Association. The Ontario Horticultural Association is a volunteer, charitable organization whose mission is to provide leadership and assist in the promotion of education and interest in all areas of horticulture and related environmental issues in Ontario. There are 278 horticultural societies in Ontario dedicated to the beautification of their communities! 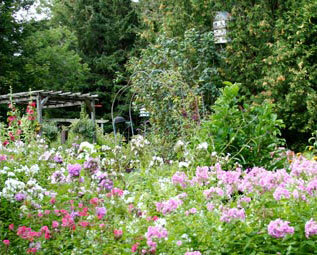 Carol Carty from Wolford House B and B in Merrickville, Ontario is located close to Rideau Woodland Ramble. She highly recommends visiting this garden. Rideau Woodland Ramble (RWR) is a Garden Centre and Display Gardens situated on 7 acres of woodland near Merrickville Ontario. Its mission is "to capture the imagination of gardeners and collectors", in a woodland setting, showcasing and selling rare and unusual hostas, grasses, conifers, magnolias, and a range of shrubs, trees and perennials. The gardens are always open from April to November, 9 a.m. to 5 p.m. 7 days a week, rain or shine. Tours are self-guided, however guided tours may be available at special request on off peak periods. The garden centre is nestled into the heart of the Ramble, and is intended to be an experience, like visiting the garden, as opposed to simply a commercial area. It is anchored by one of Canada’s largest glass enclosed Gazebos-Ramble House, home to an information and seating area as well as the sales area. For those interested in the Eastern Ontario tourism region there is a book authored and published by Jim Cooper called the Eastern Ontario Gardener's Guide, now in its third edition. It covers the area from Cornwall to Cobourg, Picton to Pembroke, Hawkesbury to Haliburton and all places therein. 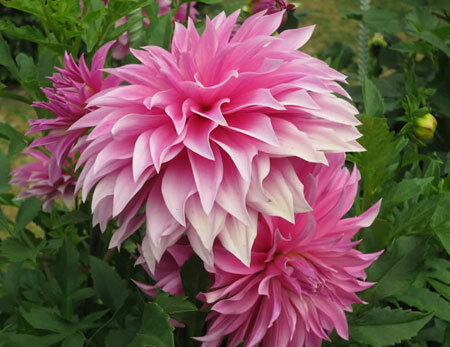 You will discover over 100 garden centres, nurseries and places of garden interest. Visiting the gardenersguide.ca will give you a preview of what is covered in the book. Wolford House B & B is featured in it and Carol’s clients have acquired the guide over the years. They see it as a fine enhancement to their B&B travels. Mary Helen and Don Deakin from The Deakins on Mountainview Bed and Breakfast are avid gardeners. They have built raised bed herb and vegetable gardens to extend their gardening season. Their guests enquire about the methods they use to increase productivity in the garden in spite of the 3b zone and unpredictable weather. They grow seeds indoors under grow lights in the spring and transfer them to their raised beds. They tell us that the most notable advantages of raised bed gardening are: increased yield due to intensive planting, weed control due to friable soil and soil management through nutrient control. They have used season extenders on selected beds and always rotate the crop. Don and Mary wanted to share information on how to create a raised bed garden. Raised Bed Garden. 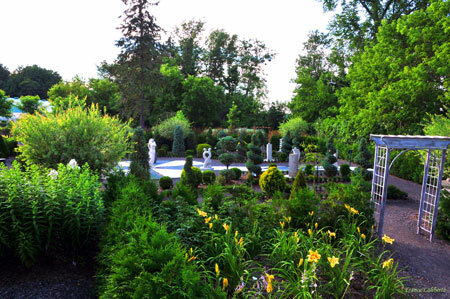 Royal Botanical Gardens in Burlington and Hamilton, Ontario is the largest botanical garden in Canada. Spread over 2450 acres, with 27 km of nature trails, it is a national historic site, and a registered charitable organization with a mandate to bring together people, plants and nature. The website has a list of what is in bloom each week and all the events that happen at the garden. Of particular note are some musical and edible events at Hendrie Park. 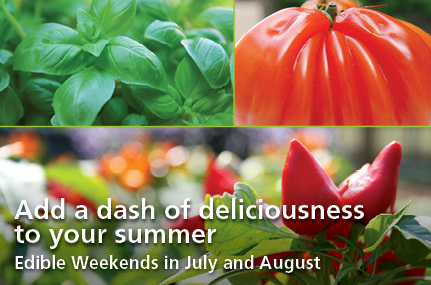 On weekends from July 6th through August 25th visitors can participate in Edible Weekends. The events go from 10 a.m. to 4 p.m. with cooking demos at 1 p.m. and educational programming all day. On Tuesdays, June 25 through August 13; 6 to 8:30 p.m. visitors can enjoy country music nights. On Wednesdays from June 12 through September 4 from 6 to 8:30 p.m., check out Red Hot Jazz and Cool Blues. A fabulous line up of live music with dinner and drinks available. 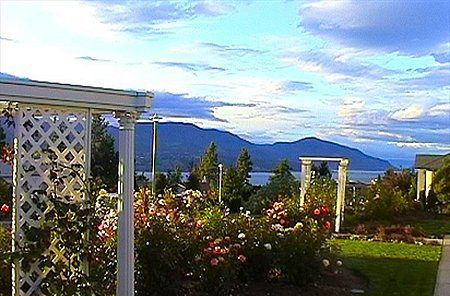 Mina Muench from An English Rose Garden in Kelowna BC has won awards for her outstanding garden with a specific focus on roses as one can imagine with her B & B name! Visit www.anenglishrosegarden.com and her virtual tour for more information. 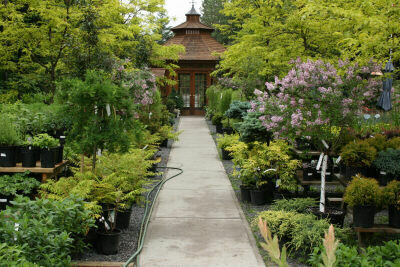 Chemainus holds bi-annual garden tours one of which took place on June 23rd this year. Visitors are encouraged to stay for the weekend in one of the area’s lovely B&B’s, two of which Timeless Rose B&B and A Scented Garden B&B were on the tour. For day-trippers Chemainus boasts many spots where you can savour a quick bite, one of which is Twisted Sisters Tearoom. The charity tour was self-guided and sponsored by the Chemainus Garden Club 2013. There were ten unique gardens to browse with Master Gardeners on site. 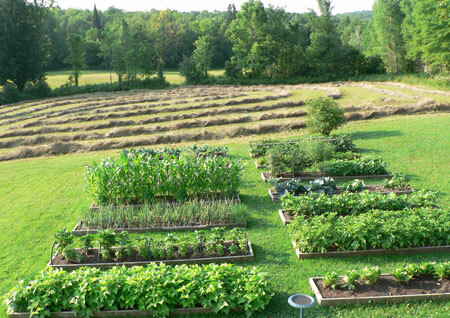 The gardens demonstrated small space gardening, acreages¸ vegetable gardens, urban gardens, scenic vistas, and more. While visiting the area stop by the Sandpiper Garden Centre and pick up more information about the area at the Chemainus Visitor Centre. 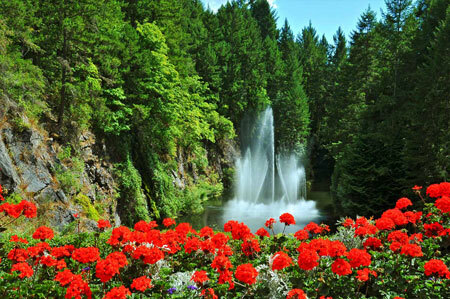 A national historic site of Canada, the Butchart Gardens is named after founders Jennie and Robert Butchart. When Robert exhausted the limestone deposits at the quarry, his wife Jennie took the initiative to fill it up with soil and start the garden on their property. Now one of the finest floral displays in the world, with a TripAdvisor Award of Excellence to their name, being named as a Canadian Tourism Commission Signature Experience, and many travel writers’ accolades, they see thousands of visitors per year. Open between mid-April and mid-November, the Halifax Public Gardens are an example of a formal Victorian public garden in the heart of a modern city. You will find floral displays, statues and fountains among the 17 acres. It is enclosed by a wrought-iron fence with magnificent ornamental gates. In 1874 the city of Halifax assumed responsibility for the original garden and and it became a civic garden in 1867. The current design was created in 1875. Band concerts take place there Sunday afternoons from mid-June to mid-September. No matter where you visit across Canada you will have the opportunity to see nature at work! Take time to delight in the beautiful gardens wherever you go! And make it an overnight stay when you are exploring by staying at one of our thousands of B & Bs across Canada. Stop to smell the roses, it’s good for you!